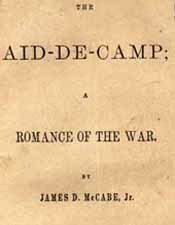 James Dabney McCabe, 1842-1883 The Aid-De-Camp; A Romance of the War. The Aid-De-Camp; A Romance of the War. Richmond: W. A. J. Smith, 1863. Beauregard, G. T. (Gustave Toutant), 1818-1893 -- Fiction. Confederate States of America -- Politics and government -- Fiction. United States -- History -- Civil War, 1861-1865 -- Campaigns -- Fiction. United States -- Politics and government -- 1861-1865 -- Fiction.